JOHN SPINNER. John was born in 1736 in the village of Northbourne, Kent. Northbourne is 3 miles inland from Deal. He was probably the son of Robert Spinner and Mary Ratclif. 1735(6) 1 Feb John Spinner, son of Robert and Mary Spinner. He was the youngest of five boys, but two of them had died before he was born. He moved to work in Deal before he married. We do not know his occupation. In the 1841 census for Deal the older Spinners were agricultural labourers or just labourers. This may have been John’s job too. SARAH PETLEY. Sarah was living in Northbourne at the time of her marriage. Petley is not a common name in this area. The most likely baptism found is in Guston, 5 miles south of Northbourne. On 7 July 1734 Sarah daughter of Leonard and Mary Petley was baptised at Guston, St Martin of Tours. This would make her 25 at time of her marriage. There is some uncertainty about the mother in this entry. It is possible that she was really Sarah, whose maiden name was Rogers. Sarah Petley was either the younger child of two or the second child of six. The wedding between John and Sarah took place in Northbourne, where Sarah was living at the time. The couple were married in the flint church of St Augustine, Northbourne, on 24 Jan 1759, when John was nearly 24. John was of Deal and Sarah of Northbourne. John signed his name and Sarah made her mark. 1760 saw the death of George II and the beginning of the reign of George III. After the wedding, they set up home in Deal. From 1761 onwards, the Spinners raised a large family there. 1766 15 Nov Richard s. of John and Sarah Spinner. Richard live only two weeks. He was buried in Deal on 29 Nov 1766. The baptismal name of John Petley for their eldest son confirms that this family are the children of John Spinner and Sarah Petley. 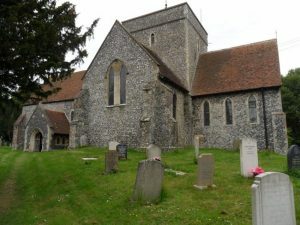 Although the children were baptised in Deal, and baby Richard was buried there, the parents returned to Northbourne for future burials. 1781 Isaac son of John and Sarah Spinner from Deal, drowned. Buried 8 July. Isaac would have been 13. We do not know the circumstances in which 13-year-old Isaac drowned. He might have been taken on by one of the Deal boatmen and died at sea. Or perhaps the teenager was the victim of an accident as he played at the water’s edge. The following year Hannah was buried in Northbourne on 8 Dec 1782. She was less than two years old. John died in 1789 aged 54. He was buried in his birthplace of Northbourne on 9 June and entered in the register as “John Spinner, from Deal”. In 1796 Lucy married John Frost in Deal. 1805 saw victory over the French in Battle of Trafalgar, at the cost of Nelson’s life. On the morning of Dec 16th the Victory appeared off the South Foreland with the remains of Lord Nelson on board. “The blue flag at the fore was hoisted half-mast as was her ensign, which was done by all the ships in the Downs lowering their pennants and ensigns to half-mast.” Kentish Gazette. Sarah Spinner was buried in Northbourne on 6 Jan 1811. This may be John’s widow If so, she was probably 74. BMDs from IGI and Findmypast.